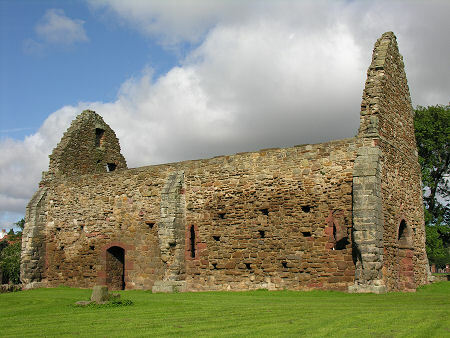 The proud ruin of St Martin's Kirk stands on the very eastern edge of Haddington. To its east is a playing field and, beyond that, open countryside. From the west and the south it is overlooked by houses built during the 20th century expansion of Haddington on the east side of the River Tyne. 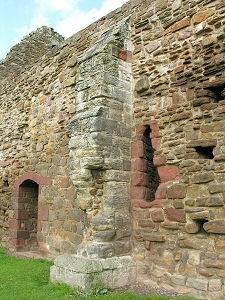 What you find today at St Martins is a roofless oblong shell standing within a larger walled enclosure. The gable ends are especially imposing and there remain traces of a barrel vaulted roof at the west end. The building is 55ft long by 16.5ft wide, and the side walls are 4.5ft thick. 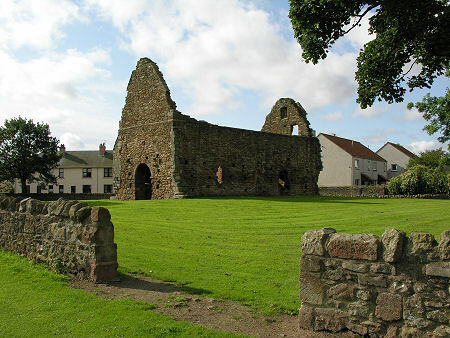 St Martin's appears to have stood just within the western gateway of the precinct of St Mary's Cistercian Nunnery and would have served as a place of worship for residents of this side of Haddington. 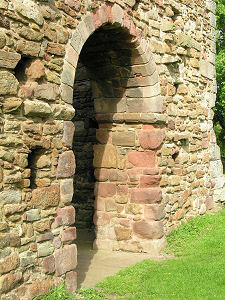 This nunnery was founded in about 1155 by Ada, Countess of Northumberland. 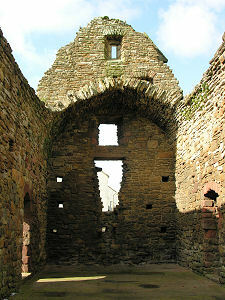 St Martin's would have been intended to provide a place of worship for the people of Haddington. 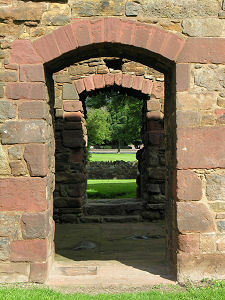 The date is approximate: most sources now date the establishment of the nunnery to before 1159. And until his death in 1152, Ada had been married to Prince Henry of Scotland, son of David I. The son she had with Henry went on to succeed David I as Malcolm IV. With such prestigious and powerful patrons it is unsurprising that St Mary's Cistercian Nunnery rapidly grew to become one of the largest nunneries in Scotland. It probably stood on a site just north of the River Tyne near Abbeymill Farm almost exactly a mile north east of St Martin's Kirk and a little south of the line of the modern A1. Today not a single trace of stone remains above ground to show the nunnery ever existed: though a visitor in 1853 was shown where the nunnery had stood by someone who said he remembered seeing remains of it there as a child. 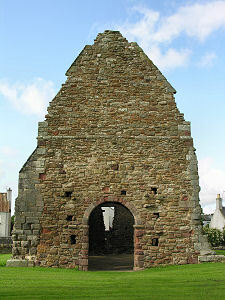 As a result, St Martin's Kirk is not just a remarkable survivor in its own right, it is also all that remains of Countess Ada's nunnery. St Martin's has seen many changes during its life and these contribute to a number of unresolved issues which add considerably to the enjoyment of a visit to what at first sight can seem a rather featureless ruin. The first unresolved issue concerns the date of its building. Although it is possible to date the founding of Countess Ada's nunnery reasonably closely, many feel that St Martin's itself may date back to the early 1100s, suggesting it predated the arrival of the nunnery and was incorporated into its precinct. At some point in its life, probably during the 1200s, St Martin's was extensively redeveloped. It seems that at this time the previous ceiling was replaced by barrel vaulting in stone, whose added weight was countered by the addition of six buttresses to the outer walls of the kirk. 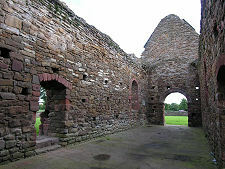 An upper floor was inserted within the kirk above the barrel vaulting, and both gables were rebuilt to a much greater height to accommodate this, with windows inserted into the west gable above the vaulting. Two further unresolved issues are intriguing. 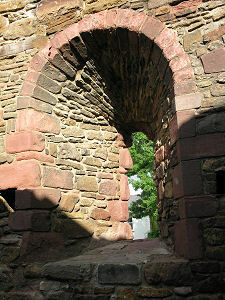 The first concerns what today appears to be an arched door in the east gable. In 1896 it was written that (then) recent excavations had uncovered traces in the ground of a chancel measuring 12ft square, which would mean that the arched door was actually a chancel arch. The oddity was that when further excavations were undertaken in 1912, no trace of the chancel was found. And if you look at the exterior face of the west gable, where you might expect to see traces of a roof line if a chancel had stood here, nothing is obvious. The oddest think of all about the structure of St Martin's is the way all four walls are pierced all the way through by rows of square holes which look to have been part of the original construction of the kirk. 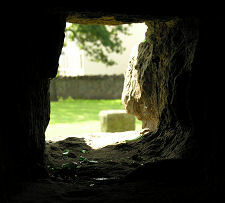 It is common to find "putlog" holes left in the exterior faces of large medieval buildings in which wooden posts were inserted to provide a support for scaffolding to allow work on the upper parts of the building. But these holes appear far too large for that, and the rows seem too closely spaced one above another. 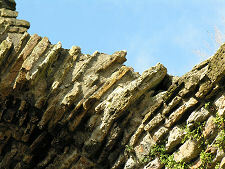 Neither does the theory explain why the entire thickness of a 4.5ft thick wall would have been pierced. In the absence of a better idea, however, it seems we have to imagine the walls being built with thick wooden beams embedded within them, projecting from both the inner and outer walls. When the building was complete, the projecting ends would have been sawn off, and the inside wall plastered and the outer wall harled. No-one would ever know the structure contained significant amounts of wood. Not, at least, until the the kirk fell out of use in the 1600s or 1700s, the plaster and harling fell away or was removed, and the wooden beams rotted, leaving the empty holes that had contained them.